We had a lovely weekend in Llandudno. The weather was fabulous and I managed to do more walking than I've done in a long time, something that made me feel quite good about myself. Every time I manage to push myself just that little bit further, it reinforces my belief that one day I'll be able to go for a proper walk (by that I mean walking the kind of distance most people walk when they go shopping in town or for a wander along the canal towpath, etc). If I make sure I'm well rested beforehand, I'm sure it'll happen. 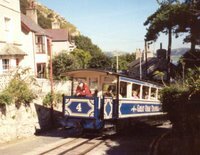 If you're ever in Llandudno, you really must take the tram up to Great Orme. The views are absolutely stunning and the trip itself is quite charming. It's an old Victorian funicular that's recently been restored thanks to some EU funding and some National Lottery money. We got home at about 9 this evening, after taking a detour over Snowdonia. I went straight upstairs for an hour's kip (lots of walking, at least by my standards, leaves me totally cream crackered), after which I did some writing so I'm now 1,239 words closer to THE END and over the 50,000 mark! I can see a bottle of champers (or at least a bottle of Blossom Hill white zinfandel) is going to be called for soon. PS: It's now bucketing down! You are amazing! Writing even after such a full weekend. Way to Go!! The Grand sounds like a typical Welsh affair. We are still in the late seventies here, and Stan the Man would easily get a contract for prime time S4C. Was there Prawn Cocktail and Black Forest Gateaux on the menu? Cherry. I've stayed in far better Welsh hotels than The Grand, that's for sure. I know they have their own quirks but this place really wasn't nice at all. Not quite the pits, but 'tries, could try harder'. Prawn Cocktail, yes - Black Forest Gateaux, no. The only dessert was trifle, although it was a rather nice trifle. Glad to hear you had a great weekend Sharon. Congratulations on your word count. Wow! I'm becoming more and more confuddled about how long a manuscript is supposed to be. HMB are increasing the font size in some of their lines, and that can lower the word count to 48,000. How do we find out for sure what we should be aiming at? What exactly are your physical problems? I'm always curious to know how things affect others. I definitely think the weather helps... when I feel better about life, I'm more likely to push myself. Mind you, I'm paying for it today. I had cramps in my legs during the night and today I'm exhausted. Just the thought of walking down the stairs is more than enough for me right now. I've just been over to both sites (m&b and eHarlequin) and both are still stating 50,000 - 55,000 for Med and Tender so I'm assuming that's what we should still be aiming for. Some of the lines are now using page counts rather than word counts so I expect it's those you're talking about? I think page counts are a pain in the derriere but then that's HMB for you! Chronic fatigue is the most debilitating thing that affects me on a daily basis, but physically my feet/legs are usually numb/weak, and I get a lot of vertigo and other weird and wonderful symptoms. I now use a stick and when I really have to, a wheelchair. If I remember correctly, I think it was Fiona Lowe who first drew my attention to the fact that the wordcount for her medical mss was 48,000. From where I am right now 48,000 feels more achievable. But as my hubby keeps pointing out to me, I'm just procrastinating again by wondering about it, lol. Sounds like me and you are pretty much in the same boat! I'm sure you've told me about all this before but there aren't always quite enough clowns in my circus. Why would they bring the word count down to 48,000? Surely that's too short even for a HMB? I know they're using bigger print - well they are in the Tender line, anyway - but why would that mean less words? You could always try asking on the UK Editors board of eHarlequin. Congratulations on finishing, Sharon! And you've already started on a new one?! Amazing! I looked up what Fiona replied to me on her blog, and this was what she said: "My books are anything from 208-215 manuscript pages. The guidelines do say 50-55,000 words and when it used to be formatted on 250 words per page mine were always around 53,000. Then they started taking computer word count and suddenly my same size manuscript plunged down to 48-49,000." I went through the whole word count thing on this blog a while back and at that point, everybody agreed that it was computer wordcount that mattered, not the 'white space' word count which is the same as 25 line per page regardless of how many words are on a line (obviously not very many if there's lots of dialogue). Now it seems things have actually been the other way around? Oh, I'm sticking with what Penny tells me. She's been writing for them for 30 years and keeps herself up-to-date with any changes and when I asked her, she said stick with computer word count and go for 50,000 - 55,000 words. Mind you, my ms doesn't differ much regardless of the way the words are counted. I agree, Sharon. It's what I'm doing, although I did take a three-month break. I guess I just couldn't stop writing and rationalized it all with MsCreativity's philosophy. After all, we don't want to be one-hit wonders, do we? Well that's part of why I've started on a new one straight off, too. If they don't want this one (which is probable) I'll be able to say "well here's another that you may like instead". After all, if they're operating with a 3 month response time and it takes me about 3 months to write one, I should have Darcie and Alex's story ready by the time they get back to me about Sherry and Leo. That's assuming they keep to their own deadlines, of course, which they don't appear to be doing at the moment. How long have you been waiting now? Seven months since the request for a full, sorry to report!